Is society upgrading really fast or has technology simply found a way to penetrate even the simplest trade like the fitness industry? Different investor-backed startups are already beginning to find ways on how to make people healthy and fit through technology. 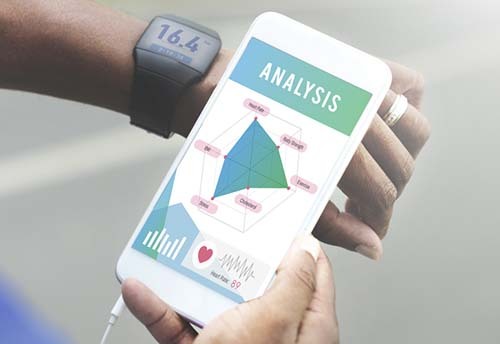 They are now personalizing the fitness coaching method using futuristic technologies like genomics, artificial intelligence (AI), and 3D scanning. For people who want to be in great shape, the concept of customizing fitness procedures is a blessing, and some startup companies are banking on this idea. The following startup companies use genomics to personalize fitness coaching. FitnessGenes – FitnessGenes is considered as a medical technology corporation based in Oxfordshire, England. The company does not just analyze DNA, it also personalizes nutrition strategies and fitness training since 2013. Dan Reardon is the Co-Founder and CEO of FitnessGenes. With a disclosed funding of $5M, the startup company has investors such as Sino-German High-Tech Fund. 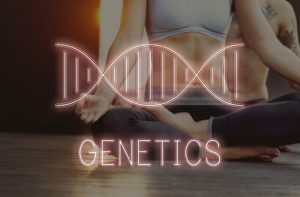 AthGene – Located in Copenhagen, Zealand, AthGene delivers genetic insights for different fitness enthusiast and athletes. The company was founded in 2015 and has been providing concise and understandable scientific findings. Yusufa Sey is the Co-Founder and CEO. AthGene has a disclosed funding of $4.7M. Magnus Kjollerm Laila Pawlak, and SEED Capital are some of its major investors. Athletigen – Headed by Jeremy Koenig, the startup company is serving as an online genetic platform. It is helping athletes to customize personalized fitness and training courses in order to enhance their performance. Athletigen was established in 2013 and it is located in Halifax, Nova Scotia. The startup has a disclosed funding of $1.6M. Its investors include Ray Muzyka, Exponential Partners, and Content Bloom. DNAFit – The England-based company presents DNA-based fitness training and diet plans for the sports and gym persons. The management wants their customers to reach nutrition and fitness goals on the most personal level possible. Avi Lasarow is the CEO of DNAFit and was founded in 2012. The startup company is considered as a healthcare equipment industry and has a projected revenue of $4.4M. It was also reported that DNAFit partnered with Vita Mojo, a London-based personalized restaurant, in order to provide DNA-driven dinners. 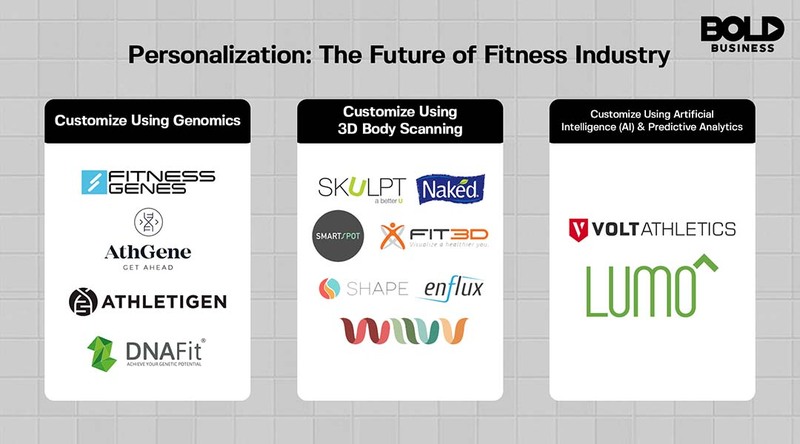 The following startup companies use 3D body scanning to personalize fitness coaching. Skulpt – Skulpt is a fitness tracking company based in San Francisco, California. The company focuses on muscle health, offering electronic devices that have the ability to measure body muscle quality and fat percentage. Jose Bohorquez is the Co-Founder and CEO of Skulpt, which was established in 2009. It has a disclosed funding of $6.59M with Indiegogo, Nautilus Venture Partners, and Caerus Ventures as its investors. FIT3D – The California-based company is considered as a web platform that delivers 3D imaging in order to monitor health metrics. The company was built to give the most thorough wellness assessment for people. Greg Moore is the Founder and at the same time CEO of Fit3D, which was established in 2012. The startup company was deemed as an application software industry that has a disclosed funding of $4.74M. Naked – Established in early 2015, Naked Labs aims to promote health through the use of honest insights. It has a 3D Fitness Tracker that provides users a holistic picture of their body and it changes over the period of time. The 3D Fitness Tracker monitors an individual’s shape, measurements, body fat percentage, and weight. Naked has a disclosed funding of $2.38M with Ruvento, Monstro Ventures, and New Enterprise as its investors. Smartspot – Headed by Moawia Eldeeb, Smartspot is a fitness mirror that has the ability to let users create real-time fitness correction and monitor their workouts. It got a machine that is deemed as the first smart mirror for gyms, providing details and insights. Founded in 2005, the startup company is located in San Francisco, California. It has a disclosed funding of $1.97M with investors like Y Combinator, SignalFire, Khosla Ventures. Shape – The Silicon Valley-based company is the face behind ShapeScale. The phenomenal device is a scale that lets people compare, track, and visualize their body shape. 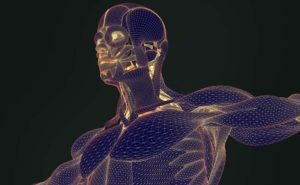 ShapeScale has the ability to make a 3D avatar that could be seen in an application to find out which part of the body is losing fat or gaining muscle. Alexandre Wayenberg is the CEO of Shape, which was founded in 2015. It has a disclosed funding of $120K with Y Combinator as its major investor. 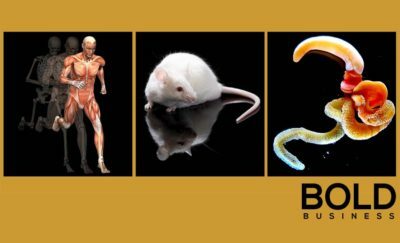 Enflux – Enflux is different from other startup companies on this list because it literally uses a 3D-printed suit to scan the body. The company was established in 2012 and has been developing athletic clothing with embedded motion sensors that monitor the 3D movement of the user’s body while moving or exercising. The startup’s embedded suit comes with a free mobile application that gathers data. It has a disclosed funding of $120K and Y Combinator is its major investor. Wiivv Wearables Incorporated – Wivv is a designer, manufacturer, and distributor of customized apparel, footwear, and body-interfacing products. The company that is based in British Columbia focuses on fitness market. It was established in 2014 where Shamil Hargovan is the Co-Founder and CEO. Wivv has an estimated total funding of $7.62M. 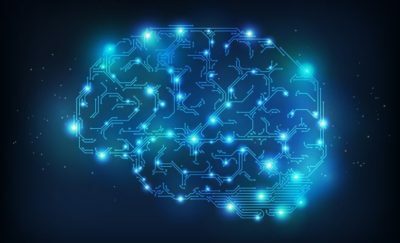 The following startup companies use AI and predictive analytics to personalize fitness coaching. Volt Athletics Incorporated – Volt Athletics or most commonly known as Volt is a mobile application that recommends individualized sport-specific workouts for users from high school to professional sports teams. The app focuses more on predictive training that tracking workout. Dan Dan Giulani is the Co-Founder and CEO of Volt, which was established in 2011. It has a total funding of $2.44M. LUMO BodyTech – Lumo Bodytech creates a biomechanics wearables platform that allows software and hardware to monitor real-time body movements. Located in California, USA, the startup company has recently partnered with Puma, a footwear brand, where they developed an AI-powered coaching product for Puma itself using the Motion science tech platform of Lumo. Monisha Perkash is the Co-Founder and CEO of Lumo, which was founded in 2011. It is said to be part of the healthcare services industry. Personalized fitness coaching is the future and it is also the next big thing in wellness, nutrition, and exercise. With the help of these startup companies, it will now be easier for people to access positive results in their body.